For sale - 1 strand of natural Citrine Nugget Shape Beads. There are between 19-21 nugget beads each strand depending on their individual sizes. Beautiful beads for a variety of uses. My pictures are not always of a competition winning standard, but I’m working on it! Citrine Marquise Beads. 5 yellow Citrine marquise top-drilled beads. Ideal for jewellery making as a focal bead or pendant. Beads and bits for creative mitts. Hole size: 1mm. MIXED SHAPED GEMSTONE BEADS OF CITRINE AND GREEN AVENTURINE. 10 yellow Citrine round spacer beads for jewellery making. Citrine Round Beads. Beads and bits for creative mitts. Hole size: 1.5mm. HALF A STRAND (17 CM) OF LOVELY UNUSUAL COIN / FLAT ROUND CITRINE BEADS. SIZE: 6.5 MM; THICKNESS: 2 MM; HOLE SIZE: 0.5 MM. As these beads are hand-cut, they may be slightly irregular in shape and size. For sale - A bag of 20 Grade A Golden Citrine, semi precious gemstone beads. Each is approx 8mm round / hole approx 1mm. These have been heat treated to exclude impurities and enhance clarity. My pictures are not always of a competition winning standard,but I’m working on it! For sale - One bag of 30 Grade AA Golden Citrine, semi precious gemstone beads. Each is approx 6mm round / hole approx 1mm. These have been heat treated to exclude impurities and enhance clarity. My pictures are not always of a competition winning standard,but I’m working on it! Yellow Citrine Round approx 8"
HAND FACETED CITRINE 5.5mm - 9mm rondelle beads, 18.5"
Hand faceted Citrine 5.5mm - 9mm rondelles, 18.5". Unlike round beads where it is a simple matter of putting the rough material into a machine, pressing a button and waiting for the process to be completed, each and every one of these beads has been made by hand. 10 yellow Citrine chunky cube beads for jewellery making. Citrine Cube Beads. Beads and bits for creative mitts. From a private collection purchased in India over 25 years ago. Unusual cut & faceted Citrine to be set into jewellery of your own design. Weighs 4.85 carats. Collect from DT8 or will post by Royal Mail. High quality natural Citrine Matte semi-precious gemstone round beads. One strand approx 16" long. Size: 8mm (47 - 50 beads). Citrine Faceted Round Beads. Size : 6mm. Yellow Citrine Clear Crystal Round Beads For Jewelry Making Free Shipping 15"
Size : 3x6mm. Citrine Heishi Beads. 220cts Citrine Drop Style Small Nuggets Approx 9x7 19x12mm. Jewellery Maker TV. Jewellery commissions and parties also available. A gorgeous selection of Citrine and Lemon Quartz Gemstone Fancy Beads. 1 Bag, contents as seen. A gorgeous selection of assorted citrine gemstone beads. Stone Shape : Rondelle. Strands Length : 12.5" Long. Stone Cut : Faceted. Stone Size : Approx 4-5mm. If you are not satisfied and happy with an item. From Brazil. The finest gemstones! The finest beads! They are good for necklace, bracelets and earrings. Material: Natural citrine. Cut: Cabochon. Note:Most of our beads, are one of a kind - Unless stated otherwise, the picture shown is a representation of the item you'll receive from the available lot. Natural Citrine Faceted Rondelle Gemstone Beads Jewelry Making Stone 13.5"Long. Stone Shape : Rondelle. Strands Length : 12.5" Long. Stone Cut : Faceted. Stone Size : Approx 3.5-4.5mm. If you are not satisfied and happy with an item. 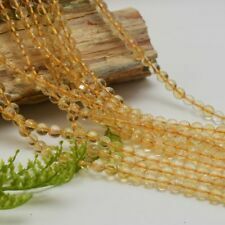 5 Strands Natural Citrine Faceted Rondelle Beads Gemstone 3-5mm 12.5" Long. Stone Shape : Rondelle. Strands Length : 12.5" Long. Stone Cut : Faceted. Stone Size : Approx 3-5mm. If you are not satisfied and happy with an item. 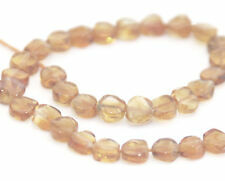 Natural Citrine Bead Strands, Faceted, Round. Colour Natural Citrine Colour. Material Citrine.